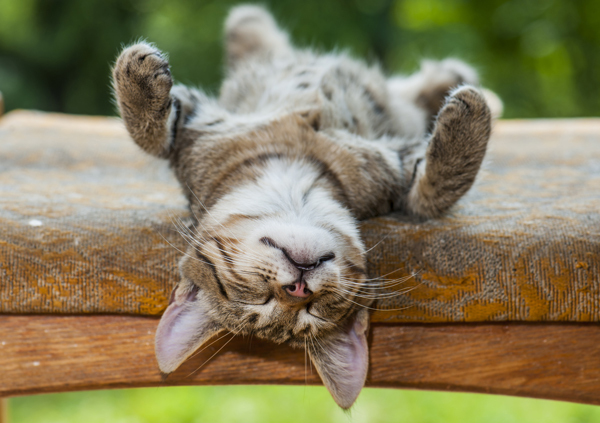 How Much Should Your Cat Sleep? All cats follow basic sleep patterns, but the amount of sleep a cat needs varies with age. Editor’s note: This story originally appeared in the May/June 2015 issue of Catster print magazine. Click here to subscribe to Catster magazine. My red tabby, Jack, frequently sleeps twisted around on his back with his front legs extended over his head. He looks like he’s making the sign for “touchdown” from an upside-down position. It doesn’t look very comfortable to me, but that’s how I often find him — which means I find him in that position a lot. How much do cats sleep? Well, like other cats his age, 6-year-old Jack sleeps anywhere from 15 to 20 hours every day. Some days I’d like to join him. Sigh. That seems like a lot, doesn’t it? I was a little surprised when I found out, too, as sometimes it seems like Jack and my 2-year-old cat, Phillip, spend the entire night batting their catnip mice up and down the hallway, only to stand on my chest at 5:30 a.m. demanding to be fed. 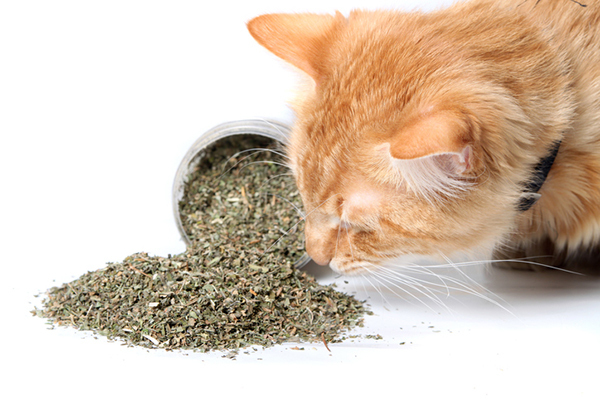 It turns out that cats get in those 15-plus hours in small doses. Cats alternate between two modes of sleep: dozing and deep sleep. The stretches of dozing usually last 15 to 30 minutes, alternating with 5-minute periods of deep sleep. When a cat is dozing, he is ready to jump up and get moving immediately. And, coincidentally, these periods of dozing are probably where the word catnap came from. 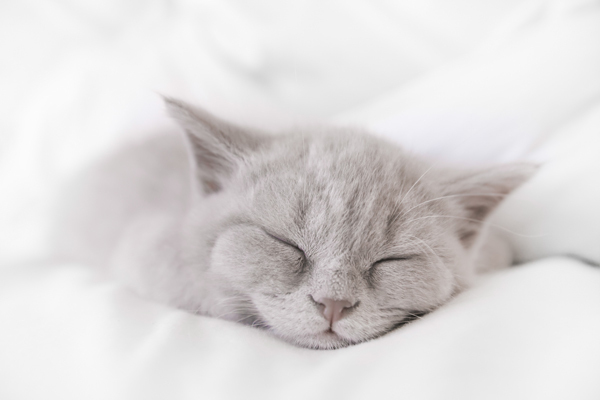 Cats of all ages follow these basic sleep patterns, but in terms of cat health, the amount of sleep a cat needs may vary a bit with the cat’s age. And, much like humans, every cat has his own sleeping needs. Kittens sleep more than the average adult cat. In fact, newborn kittens sleep almost 24 hours every day, waking only to nurse for short periods and then going right back to sleep. If you’ve recently added a new kitten to your household, don’t worry if he seems to sleep all the time. A kitten’s body releases growth hormones when he sleeps, so he’s just working on getting bigger. Don’t worry: If your kitten seems to suddenly fall asleep in the strangest places, there’s no need to worry. Phillip would fall asleep on my daughter’s chest almost as soon as she picked him up. I also would find him curled up in my laundry basket, and it remains one of his favorite places to sleep. Be concerned: Kittens sleep deeply, but if it seems particularly difficult to rouse your kitten from sleep, take him to your vet to make sure nothing’s amiss. Adolescent (or junior) cats don’t need as much sleep as kittens, but you’ll still find these young adults stretched out in the sun whenever they get a chance. You may also notice that your young cat seems most active in the evening; Phillip in particular gets what I call the “cat crazies” and races around the house right around the time I get home from work. At first I thought he was just happy to see me, but now I know it’s because cats are what’s called crepuscular, meaning they are most active at dusk and dawn. 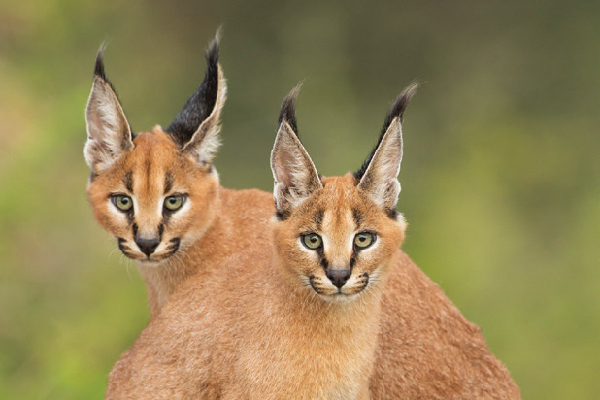 They’re not nocturnal, though some cats seem to have active spurts in the middle of the night. Don’t worry: When your cat wakes up at dawn every morning, it’s because that’s when his natural prey is awake, too. He’s wired to be awake with the sunrise. Be concerned: If your cat wanders the hallways howling at all hours of the night, he may have a medical issue, so take him to the vet at your first chance. Adult cats fall roughly into the same category as adolescent cats when it comes to sleep. What I have noticed with my two cats — Jack being right in the middle of his adult phase of life, with Phillip nearing the end of his adolescent stage — is that Jack is more set in his napping habits. He has well-established favorite sleeping spots — the little “cave” of his cat tree, a sunny spot on my bedroom floor, the nest of blankets in my son’s room — and seems to visit them at the same times every day. Phillip is more unpredictable, choosing to nap wherever is most convenient, like on clean laundry stacked in a basket, or where it is quietest, like the back corner of my walk-in closet. Don’t worry: Your cat may vary his sleeping spots and sleep in a strange assortment of positions, but that’s perfectly normal. Be concerned: If your cat seems reluctant to move from a certain position or can’t seem to get comfortable, he may be in pain. Have your vet examine him as soon as possible. 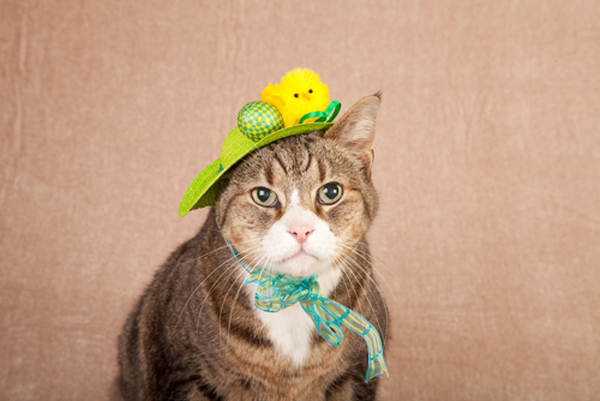 Don’t worry: If your senior cat wants to spend more time dozing in the sun, just let him be. 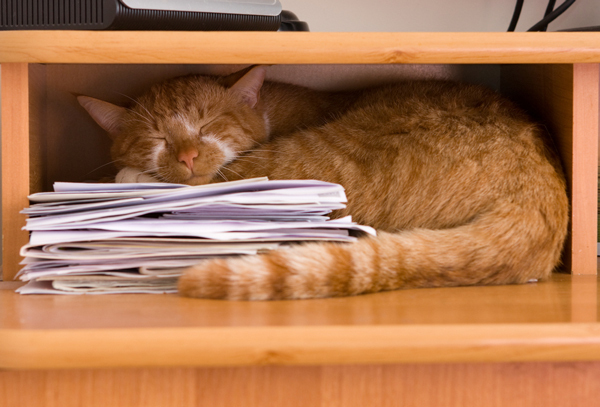 Be concerned: If your cat seems to nod off much more than usual, he might be sick. Take him to the vet to make sure everything is okay. Why Do Cats Sleep Where They Do? 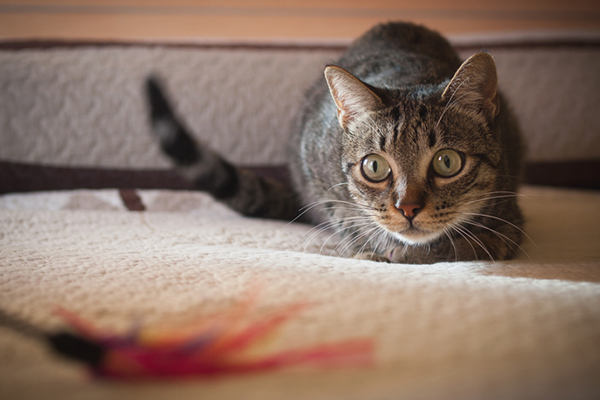 Ask a Vet: Can Cats Suffer From Sleep Disorders? About the author: A lifelong cat owner, Stacy N. Hackett writes frequently about cats, cat breeds, and a range of pet-related topics. A big source of inspiration for her writing comes from her two cats: Jack, a 6-year-old red tabby domestic shorthair, and Phillip, a 2-year-old gray-and-white domestic shorthair. Both cats were adopted from local pet store adoption events, and both bring a lot of personality and love to a household that also contains two teenagers. Stacy also is “stepmom” to a wonderful Cocker Spaniel/ Labrador Retriever mix named Maggie, as well as two brown tabby domestic shorthairs named Katie and Leroy.